Alsip & Company Web Store - "The MVP"
"The MVP" is the ultimate go anywhere, play anytime Canoe game certain to bring back great memories. That old baseball glove. The weathered saddle still hanging in your tack room. Perhaps a briefcase handed down from your grandfather. Whatever the piece, I will wager that through the years it was well cared for; hand-oiled, rubbed and buffed. The MVP appears timeless. 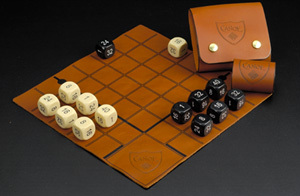 Its russet color 12x12x1/8" leather board with matching case and strap has been designed to withstand years of travel-play-wear & tear. The cowhide is chrome oil tanned top grain (5-6 ounce sides) leather. The face of the board is ink-screened and embossed. An ample supply of Pecard leather dressing is included with each game.